Many laboratories, needing to upscale their workflow, have found laboratory automation a costly and difficult option. On looking to develop an affordable entry-level system that provides sufficient functionality, Peak Analysis & Automation, a leader in the industry for the design and manufacture of automated laboratory equipment, consulted with the low-cost automation specialist igus. 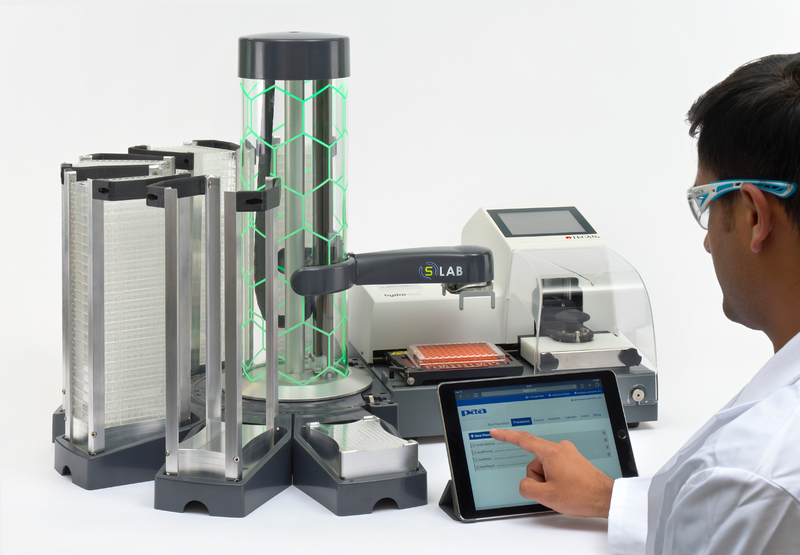 The result is the S-Lab automated plate handler, a small pick & place machine that is compatible with up to 300 different laboratory instruments. “Redefining how automation works, the S-Lab eliminates the need for costly bespoke hardware and software, providing a reliable ‘plug and play’ solution for single instrument loading,” says Dr Malcolm Crook, Technical Director at ‎Peak Analysis & Automation. Designed for easy installation and out of the box use, this small automated plate handler can process up to 100 standard or 30 deep-well petri dishes. It also handles up 80 lidded petri dishes, providing sterility for cell-based assays. One of the main requirements for this piece of equipment was its small size to enable it to fit on a standard laboratory workbench. As such, it was also envisaged that it had to operate quietly as technicians would be working close by. The compact base unit is a robolink joint, which acts as a turntable rotating at between 6-7 rpm, and on top sits a drylin belt drive, which moves up and down at a speed of 200mm/s – both of which operate smoothly and quietly.